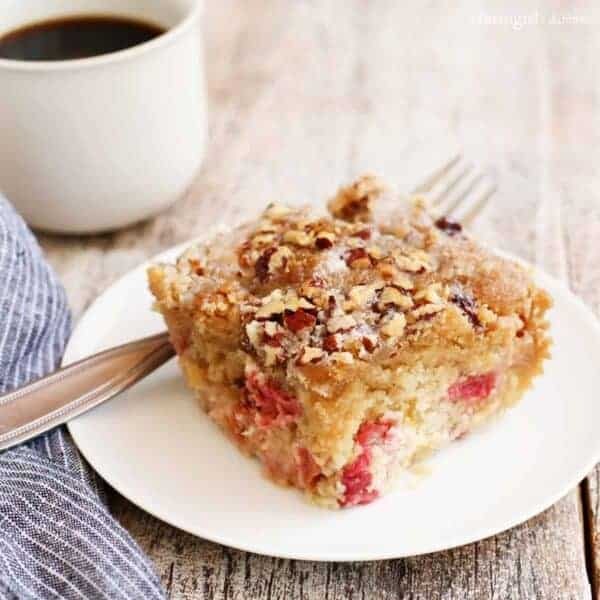 This Rhubarb Nut Coffee Cake is super tender, with tart little bites of rhubarb contrasting with a sweet sugary crunchity topping with chopped nuts. This might very well be the first recipe I ever requested from my mother-in-law, Loree. She had made this super tender coffee cake while Blake and I were back in North Dakota visiting for a weekend. I couldn’t help but fall in love with its tart little bites of rhubarb contrasting with the sweet sugar crusted topping. And the scattering of chopped pecans over it all was just the perfect finish. 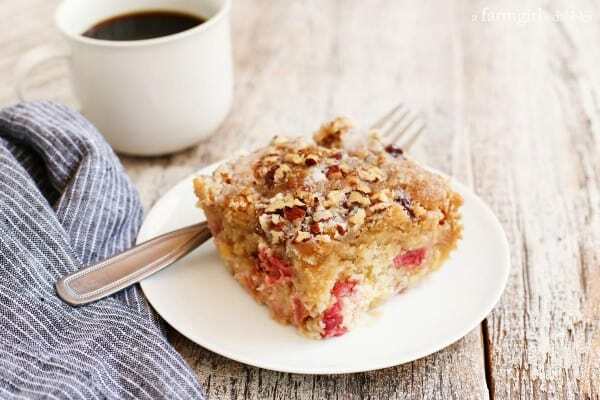 I know that Loree’s Rhubarb Nut Coffee Cake will grace our table for many years to come. 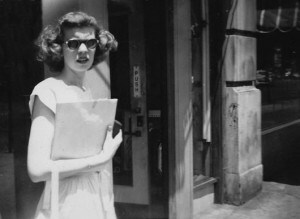 Loree on a high school class trip. If you’re wondering how to pronounce my mother-in-law’s name, it’s “Lor – ay”. And it’s exactly this wondering that brings my MIL much dismay. She can’t believe that her mother gave her a name that nobody can get right, both in spelling and pronunciation (“Lorie this, Lorie that…”). She really, really, REALLY dislikes her name. But I don’t. I think Loree is a beautiful name for a beautiful woman with a gigantical beautiful heart. I really, really, REALLY do! If you have some fresh spring rhubarb on hand (if you don’t, I’ll bet a neighbor or co-worker has some they’re trying to get rid of! 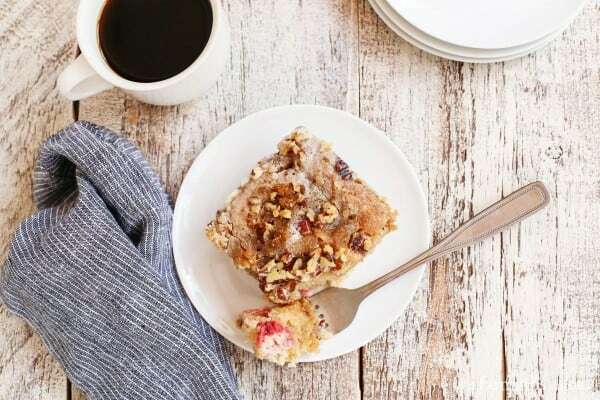 ), give this excellent coffee cake a try. The cake is sweet, perfect with a cup of coffee or a glass of milk. It’s also not short on calories. But I like butter, sugar, and cream, and I’m not ashamed to say so. Everything in moderation, my friends. 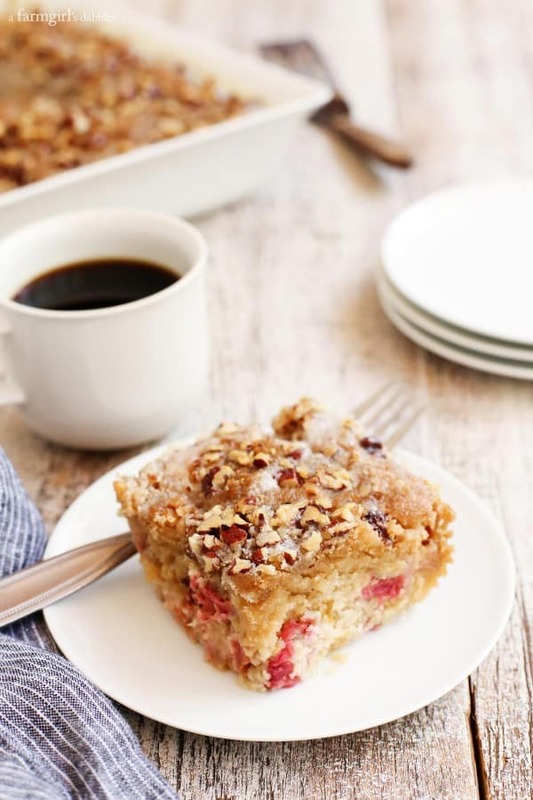 I think the perfect time to eat this rhubarb nut coffee cake is about an hour after it has been removed from the oven and slathered with the creamy buttery yum. The cake is still warm at this point and the yum will have a crunchy edge to it. Enjoy! Preheat oven to 350°. Spray a 9″×13″ pan with cooking spray and set aside. For the cake, cream together butter and sugar, then beat in egg. Stir in buttermilk. Add flour, baking soda, salt, and cinnamon, mixing gently until combined. Stir in vanilla. Fold in the rhubarb and pour into your prepared pan, spreading evenly. Sprinkle with all of the brown sugar and then the nuts, pressing the nuts into the cake a bit with the back of a spoon. Bake for about 55 minutes, or until center of cake has firmed up. Remove from oven. Place all of the creamy buttery yum ingredients into a saucepan over medium heat. Stir until the mixture comes to a boil. Stir for 1 minute to dissolve the sugar. Remove from heat. Pour the warm yum evenly over the warm cake and let it soak in. Sometimes I poke small holes into the top outside perimeter of the cake to allow the yum to soak in better. Try to not let a big amount of the yum to pool onto the center of the cake, or that part of the cake will get overly saturated. Sometimes I don’t use all of the yum. Up to you! From the recipe box of my mother-in-law, Loree Score. This post was originally published May 2010. Photos and some of the text were updated June 2016.